So far during my summer of research there have a combinations of highs and lows. Leading up to now, much of my research has been spent in trying to troubleshoot the issues with my project and trying countless different approaches to attempt to successful express and purify my protein of interest. Needless to say, there were definitely some frustrating days where after a week of work and anticipation resulted in a negative result. I can proudly say I have found many ways to NOT express my protein of interest. Yet even in frustrating times there were many lessons to be learned and interesting topics to understand. Often times scientists talk about how they learn the most from their failures, and this concept has never been more evident to me. However, not too long ago I experienced the opposite of such valleys. Having tried a new bacterial strain and additive of glucose to my cultures, I was able to express and purify my protein. It was definitely a great feeling to see positive results and to see the product of countless hours of work. This result now allows me to continue moving further into the project and approach the ultimate goal of solving a structure. With the protein expressed, I can now run different assays and experiments to further test the reactivity and nature of this particular protein. Seeing both sides of the story in research, in failure and success, has definitely made me appreciate how much there is to learn in both regards. Failure brings knowledge and information that success can’t, and same vice versa. I look forward to continuing my project and experiencing the joys and woes of research to come. What is the structure of RAMOSA3 and what are its implications outside the trehalose pathway? In corn, RAMOSA3 (RA3), a metabolic enzyme, is responsible for the dephosphorylation of trehalose-6-phosphate to create trehalose. Mutated versions of the RA3 protein have shown phenotypic differences in the development of corn, creating long branches at the base when compared to the wild-type corn stem. However, it is still unknown how altering this particular protein ultimately creates these phenotype differences and what exactly are the moonlighting capabilities of RA3. We suspect that RA3 has transitional regulation capabilities, whether through the regulation of RAMOSA1 (RA1), a known transcription regulator, or by its own means due to its acting upstream of RA1. We attempted many different approaches to express the plant protein RA3 into different strains of Escherichia coli (E. coli), testing many strains to find one most optimized for creating such protein. Further, we tested different conditions, altering temperature and time, in which to grow the bacteria in order to optimize protein expression. We also created a custom purification process best suited to isolate the protein of interest to run assays to test its function. Lastly, X-ray crystallography will be utilized with successfully grown crystals with RA3 in order to solve a structure. Our findings suggest that the C43 (DE3) strain of E. Coli was best suited to express this protein after being grown for three hours after induction at thirty-seven degrees Celsius. A purification process focused on the histidine tag within the protein was successful, as a process of a nickel column combined with imidazole washes isolated the protein. *Future assays and advancements in the project will allow us to reach further conclusions. At the moment, our results allow us to suspect that it will be possible to solve a structure of such protein and possibly create crystals to perform X-ray crystallography. Our future conclusions will allow us to confirm the function of RA3 as well as further develop the possibility to solving a structure. Investigating the possibility of solving a crystal structure RAMOSA3 through analysis of expression and enzymatic activity. RAMOSA3 (RA3) is a metabolic enzyme in maize that is responsible for the dephosphorylation of trehalose-6-phosphate to create trehalose. Mutated versions of RA3 have resulted in phenotypic differences in inflorescence branching at the base of the axillary meristem within maize. However, the transcription regulation functions of RA3 and its signaling interactions with other molecules are still unexplained, making a solved crystal structure vital for further knowledge. This study investigates the possibility of crystallization through expressing large amounts of RA3 in bacteria, purifying the protein, and confirming the function of the isolated protein. We tested expression of RA3 in multiple Escherichia coli (E. coli) through Isopropyl β-D-1-thiogalactopyranoside induction and variating temperatures and growth time. Then, we designed a purification process targeting the hexahistidine tag in RA3 to isolate the protein. Sentence about assay here. Our results show that RA3 was most optimally expressed in the C43(DE3)pLysS strain of E. Coli at 37 ℃with a 3 hour growth time and isolated with a NiNTA Agarose column followed with step elution of imidazole. Sentence about assay results here. The study suggest that crystallization is possiblewith the condition of (conclusion depends on assay results). My week was highlighted by great chalk talks from every member of the BSURF program. I definitely learned a lot about various topics and projects. Further, these chalk talks spark my interest in new subjects and has gotten me talking about things I normally would have never even thought about! This week was a great lesson in the communication aspect of science and research: having to prepare a chalk talk, listen to presentations from others, and explore other topics through challenging question has certainly helped me to see the utmost importance communication and discussion has in research. Something to be noted is a question asked during my own chalk talk as given me a new idea in which to approach my project, something that might actually help move along my project objective. That being said, a talk that particularly stood out was the one presentation by Simeon. Simeon gave a chalk talk on the study of essential genes involvement in cryptococcus neoform sexual reproduction expression. He began with a bit of background information, presenting the case that cryptococcus is a fungi that can cause brain damage to those suffering immunodeficiencies. Cryptococcus is specifically hard to target and create successful drugs to combat it as through its sexual reproduction process different and various types of the cryptococcus fungi are formed and some of these will ultimately carry drug-tolerance. Therefore, going into his project, Simeon noted that he is targeting two essential genes involved in sexual reproduction. Using different constructs, the goal is to test three different approaches and see which conditions will ultimately repress sexual reproduction the most. Having more information on what successfully alters the reproduction expression within these fungi could build toward antifungal treatments in the future. I found this presentation to be particularly interesting due to the way in which they approached this drug-tolerance issue. Approaching this issue from the perspective of altering sexual reproduction creates an opportunity to then create drugs to target specific types of cryptococcus to combat this fungus. Other studies focus on functional proteins within the fungi or creating drugs that will be undeterred by such tolerance, leaving this approach quite interesting. As this fungi issue is a big clinical problem around the world, this different approach could ultimately begin to lead toward a solution to this problem. I am very much looking forward to see the information or conclusions gathered by this project and others at the end of the program! Get To Know Dr. Brennan! Dr. Richard Brennan began his undergraduate studies at Boston University where he was initially a chemistry major, but eventually transitioned to studying biology. Dr. Brennan fell in love with studying English and communication, leading him to a minor in history. Till this day, he emphasizes the importance of language and communication within science and advocates for all scientists to become trained writers. He noted to me that during his undergraduate years he found that science is just as creative as the arts, furthermore, scientists are creative in a unique way that blends subjects from multiple areas. This passion led him into research the summer before his junior year where he was part of a fellowship research program. The creativity in the lab instantly drew him towards research, and during his junior and senior year he worked in a biochemistry lab. In some sense, Boston had become the perfect place for him to begin his research career as it offered rich history and advanced resources in research. After his undergraduate studies, Dr. Brennan attended Cornell to start a Ph.D in biochemistry. However, as he went straight into graduate school without a break, he decided to take a year off and research at biochemical genetics lab with the purpose of going back to school in a year. Through this process he came to become very interested in structural biology: throughout his earlier years he had worked on a project involving proteins that centered around the develop of a male birth control pill, and he came to find he interested in being able to see the things he was studying. With that interest, he found a home in the University of Wisconsin which was, and still is, one of the leaders in x-ray crystallography research and biochemistry. Here, Dr. Brennan did a lot of work with creating structures for long DNA and made restriction enzymes. After his work in Wisconsin, he chose to set out to the University of Oregon where he solved a structure of a protein DNA complex (only 3 or 4 other known structure at the time!). He was faced with a decision to take a job in Boston or in Portland. Eventually he chose to work at the Portland Medical School where he would spend 20 years, become an endowed chair, and build a strong program. After some time, he moved to MD Anderson in Houston where he was tasked with strengthen their biochemistry department. Here, his program did extremely well in their research and scientific endeavors; however, due to academic structure, it was difficult to attract students. Then one day, Duke University contacted Dr. Brennan about becoming Chair of Biochemistry. Dr. Brennan has since been the Chair of Biochemistry at Duke as of January 2011, where he continues to do research. I asked Dr. Brennan what his goals were along the way and whether he experienced any hardship along that way that might have altered them. The over-encompassing question he was interested in figuring out was how things work. His focus in structural biology allows to develop and understanding in how certain functions work and develop a deep understanding in the “why.” Further, Dr. Brennan had a goal on figuring how to see why certain things worked the way they did. This fit the idea of structural biology and how solving a structural allows you to truly understand why it works the way it does. Without the basic information on what something looks like, you cannot do any further experiments or research with this specific thing of interest. His goal was to apply creativity in research in order to answer these questions. Yet, Dr. Brennan accounted to me that during his Postdoc work, he became curious with the idea of leaving academic science and turning toward a career in scientific writing. And so, he interviewed for the head editor at a science journal. He was selected for job and was forced to make a decision. He evaluated which road would give him the most creative freedom as that was of utmost importance in his research and academic endeavors. Eventually he chose to stick with academic science as it offered him the best route to continue answering his questions, and he could also continue to write within academic science. To this day, Dr. Brennan has continued his work in research and contributing towards the structural biology field. Dr. Brennan is currently interested in studying how multi-tolerant cells work and how activation signals are triggered. Dr. Brennan has continued to share his perspective in the creativity of science through teaching at Duke University. He enjoys teaching due to the interaction and opportunities there are to inspire future scientists. He believes that individuals should teach at schools with high-end resources as it’s important to share what you’ve learned others. As one final piece of advice, Dr. Brennan warned against the elitism in science. Very much discouraging this attitude, he cites the stereotyping when it comes to choosing universities and places to study. Often times scientists miss out on opportunities because they make choices with predetermined ideas. It’s important for scientists to adopt an open-mindset and one that truly values everything on the same playing field. As I mentioned before, I am currently working in the Brennan Lab, a Biochemistry lab that has previously done extensive research into the trehalose pathway within fungi. In order to lead into my project, it is important to understand more about certain research in the Brennan lab and what exact implications it has in the large scheme of things. Throughout recent times, immunocompromised host populations, whether transplant recipients, cancer victims, and other ICU patients (Intensive Care Unit), have continuously been invaded and killed by fungal diseases. In a search to identify antifungal targets, the Brennan lab investigated the trehalose pathway due to its fungicidal characteristics, broad relevance to many different types of fungi, and its low toxic consequences in mammalian species. Looking a bit closer into this research, the trehalose pathway in fungi is regulated by two important enzymes that basically form the backbone of trehalose formation: Tps1 (trehalose-6-phosphate synthase) and Tps2 (trehalose-6-phosphate phosphatase). Tps1 creates trehalose-6-phosphate (t6p) from glucose-6-phosphate while Tps2 ultimately forms trehalose from t6p. Trehalose is extremely important in fungi survival as it has implications to energy reserves during times of stress and is crucial to carbon metabolism and regulation. Tps2 has been identified, due to structural research and animal tests, to be an ideal fungicidal target as mutant Tps2 fungi cannot survive in high stress environments. However, recent research has also uncovered that Tps1 and Tps2 seem to serve other functions within fungi than simply the trehalose path way, signaling that these are possible “moonlighting” proteins. Well, you’re probably wondering, how does all of this relate to plants and my project? Recently, collaborators of the Brennan lab have studied a protein in maize, RAMOSA3 (RA3), that is part of the trehalose pathway in plants. RA3 serves the purpose of converting trehalose-6-phosphate into trehalose, an analogous function to that of Tps2 in fungi. Yet, when RA3 was mutated in maize, the phenotype of the maize changed and at the stem of the maize, and weird abnormally long branches would begin to form. This gives some indication that RA3 is much more than just a regulator within the trehalose pathway. Once again, this RA3 enzyme is suspected to have possible transcription regulation implications. My project is focused on taking the plasmid containing the RA3 protein and materials sent by collaborators to express the protein, purify it, confirm its function, and ultimately create a structure of it. In order to better understand the functions of RA3 and its implication or analogous functions to the possible fungi trehalose path, we need a literal structure of the enzyme to study substrates and other similar patterns. The moonlighting similarity is yet another thing to be studied. As RA3 is relatively still not understood, my project is focused on create a better familiarity with this enzyme. This summer, through the 2018 BSURF Program, I will be researching in Dr. Brennan’s biochemistry lab. Specifically, I will also be working with a graduate student in his lab, Grace. Previous to this program, I had only really done wet-lab work in courses, college and high school, where students simply followed instructions and completed a lab report. 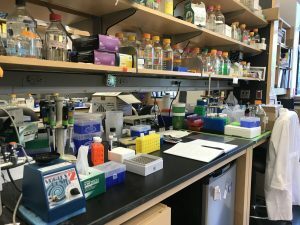 This experience would be my first time independently researching within a lab, creating a sense of excitement, uncertainty, and curiosity within me. Primarily, I am expecting to learn a lot about lab procedures and the topics relevant to my specific focus in biochemistry. As mentioned before, as this is my first official lab experience, I am excited to get a glimpse into the life of a researchers and how he or she goes about answering a scientific question. The basic lab procedures, writing in a lab notebook or how to develop certain solutions and results, will be knowledge for me that will be essential in the future. I am curious to know the “why” behind everything, being prepared to ask questions that helps me develop a better scientific knowledge and basis for why certain things are done. I am hoping this knowledge helps me gain a better understanding of the things I have learned in the classroom, as well as preparing me with concrete methods and approaches to solve problems in potential future research. 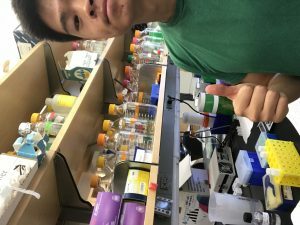 Whether it is seeing why researchers in this lab use certain antibiotics of a specific chemical make-up compared to another or why an environment induced better protein expression than another will allow me to apply all those “textbook” concepts I learned in past courses and develop a new perspective on them. Expanding off just gaining more knowledge, I am looking forward to this summer as a place where I can start solidifying what I will be studying or majoring in the future. Personally, I learn better in environments that are hands-on and places where I can make mistakes and discover more about the topics I am applying. This experience will allow me to see if Biochemistry or chemistry is a possible route of study I would enjoy, as I ultimately see myself applying the concepts in a classroom rather than just simply learning them. Working in this lab will give me an idea of what a specific learning path will lead to. Lastly, I am definitely excited to meet new peers, mentors, and friends along this summer program. Seeing as researchers collaborate a lot, building a relationship with those in my lab and within the program is something I will be focusing on. Getting to know both Dr. Brennan, the graduate student mentoring me, and other people in the lab is something I can’t wait for. Furthermore, students in BSURF are a collection of some of the most intriguing and friendly people to get to know better. Other than that, people here still at Duke, such as the Huang Fellows, are more students to get to know better. Building these new relationships and networks will certainly make this summer quite the experience.